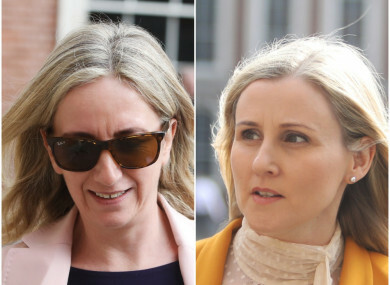 A JOURNALIST FOR the Irish Daily Mail has told the Disclosures Tribunal that she was told by a colleague that Maurice McCabe was “a child abuser”, and that negative information about McCabe had come from Nóirín O’Sullivan and Superintendent David Taylor. Alison O’Reilly was giving evidence at Dublin Castle for the first time this morning as the Tribunal continues to look into the claims of a smear campaign against McCabe to the media, and she said that it was her colleague Debbie McCann who told her this. She said that when she asked McCann “what do you mean McCabe is a child abuser?”, McCann’s response was that everyone in the gardaí knew about it. O’Sullivan and Taylor have disputed O’Reilly’s version of events to the Tribunal. O’Sullivan said she never gave such negative briefings to McCann, while Taylor said he never told McCann that McCabe was a “child abuser” or that he gave out Ms D’s name and address to anyone. McCann, meanwhile, has said she was never aware of, or participated in, an orchestrated campaign against McCabe, and that anything they said was a discussion among colleagues. O’Reilly told the Tribunal that she would have talked with McCann about the garda whistleblower controversy regularly during 2013/14. She said that McCann told her she’d been given the name and address of Ms D – the woman who’d made an allegation of sexual abuse against McCabe in 2006. At the time the case was investigated, and McCabe was exonerated by the DPP. She said that when McCann told her McCabe was a “child abuser” and that she had gotten the name and address of Ms D, she asked where this information had come from. She added that McCann told her she’d heard it from David Taylor and Nóirín O’Sullivan. O’Reilly didn’t specifically say if McCann told her it was either of those who gave the name and address of Ms D, however. O’Reilly did say she was suspicious of what she was hearing about McCabe, at the same time he was whistleblowing against the gardaí. After meeting McCabe, O’Reilly said her “gut feeling” told her there was nothing in the rumour and that she believed him. I said ‘where is it coming from? Your pal Nóirín?’ She said yes. In her evidence this week, Nóirín O’Sullivan said that she would have never have classed herself as McCann’s pal, and didn’t pass on any information to her negatively about McCabe. In evidence this afternoon, O’Reilly maintained that McCann told her that she’d been giving negative information about McCabe by Taylor and O’Sullivan. However, a statement that McCann has given to the Tribunal was put to her, where she said that she “wasn’t involved in any orchestrated campaign to malign Maurice McCabe”. O’Reilly also talked about going to Labour leader Brendan Howlin with the information that she had in early 2017. She said that she felt uneasy about what she’d heard about McCabe in the years prior. “I felt I needed to say something,” she said. O’Reilly denied that she made these statements because of a grievance against her employer, against whom she has a number of High Court cases currently. “I have a legitimate claim I’m taking to the High Court. It has nothing to do with the Tribunal,” she said. At the end of O’Reilly’s evidence, both counsel for the Tribunal and Mr Justice Charleton wanted to know what Debbie McCann’s case was. She has already denied being aware of a smear campaign or giving a briefing about McCabe to O’Reilly, but Mr Justice Charleton wanted to know if McCann also denies the content of her conversations with O’Reilly. McCann is expected to give evidence to the Tribunal in the coming weeks, to face questions about O’Reilly’s claims. Brendan Howlin followed after O’Reilly. He said that after what O’Reilly told him in early 2017, he needed to give that info to the Dáil, and that it was essential her account informed the terms of reference for any inquiry into these matters. He said: “I think she had taken a deep interest in the whole conversation about Sergeant McCabe. She felt she had information she needed to put into the public domain. I believed her then. And I believe her now. Journalist Gemma O’Doherty was also giving evidence again today at the Disclosures Tribunal. Her role in all this comes chiefly through an article she wrote in 2013, about then-garda commissioner Martin Callinan having penalty points wiped from his licence. She had a Pulse file to that effect in her possession, but to make sure that the Callinan on the file was the Martin Callinan, commissioner of An Garda Síochána, she went to visit his home. O’Doherty was dismissed from her job at Independent News and Media shortly afterwards, and later settled a suit for wrongful dismissal. There were some testy exchanges between Gemma O’Doherty and counsell for the former garda commissioners this morning. They wanted to look at a story O’Doherty wrote back in 2014 about a Traveller woman whose children had records on the garda Pulse system. A superintendent who looked into the case said that O’Doherty told him she got the Pulse record from Fianna Fáil TD John McGuinness via Maurice McCabe. O’Doherty, however, claimed privilege and said she didn’t want to reveal her source. Mr Justice Charleton intervened and said he didn’t want to make a ruling on journalistic privilege because he “didn’t see the point”. O’Doherty was also asked about posts on her social media about Nóirín O’Sullivan and Martin Callinan. She was asked if she used her social media pages to criticise Martin Callinan and O’Doherty replied: “Oh, yes”. Mr Justice Charleton again intervened and appeared dissatisfied with this line of questioning. He said that he wasn’t going to let this become like the Mad Hatter’s tea party and that “we’re making as much progress as a snail travelling between Cork and Dublin”. It was also put to O’Doherty that she had improper motives for coming forward with information to the Tribunal. Counsel for Callinan and O’Sullivan were very strong on this point. It was put to O’Doherty that she had made a “pitch” to be invited to give evidence, that she was “anxious” to make herself relevant. O’Doherty told the Tribunal that she believed she “lost her livelihood for supporting the work that Maurice McCabe was doing” and that she believed it was important that the public hear her evidence. The Tribunal will sit again tomorrow, with further evidence from O’Reilly, Justine McCarthy, Colum Kenny and Philip Boucher-Hayes. Email “'I said where is it coming from - your pal Nóirín? She said yes'”. Feedback on “'I said where is it coming from - your pal Nóirín? She said yes'”.